A few weeks after the federal election, we talked to young Germans about what they made of the election results, the rise of far-right Alternative for Germany party and the media’s role today. On Sept. 24, Germany held elections for the federal parliament. While few doubted that Angela Merkel would win her fourth re-election, the results were awaited anxiously. Merkel’s center-right Christian Democratic Union of Germany secured 33 percent of the vote, but the result was a bittersweet one for Merkel and the other established parties. Although Merkel will remain chancellor, the 2017 election was the party’s worst result so far. Merkel’s main opponent Martin Schulz, who led the center-left Social Democrats, finished with a distant 21 percent. The September election result also marked the beginning of tedious coalition talks between the parties that will build a possible government with Merkel’s union. The continuation of the „grand coalition“ between Merkel’s and Schulz’ parties would meet the requirements to form a government but was ruled out by Schulz, who blamed Angela Merkel’s campaign for refusing a debate about the country’s future. The debate post-election, however, focused on another party, the Alternative for Germany, a populist right-wing party commonly known as the AfD. Both the Social Democrats and the Christian Democrats failed to mobilize their traditional bases while the AfD filled some of this vacuum. The party’s campaigns had focused on challenging Merkel’s reactions to the refugee crisis by tapping into anxiety and fear over the influence of Islam in Germany, often with xenophobic and Islamophobic rhetorics. With 13 percent of the vote, the AfD entered the parliament and are now, in fact, the third-largest party. The party’s top candidate, Alexander Gauland, reacted to the results by stating „We will take our people and our country back.“ Some said that the parliament election felt more like a belated referendum on the refugee policies, with the other parties failing to set different priorities. The AfD has profited from that, by voicing and triggering emotional reactions and concerns like the impact that Muslim migrants were perceived as having in Germany, while the Social Democrats and the Christian Democrats seemed determined to avoid these. 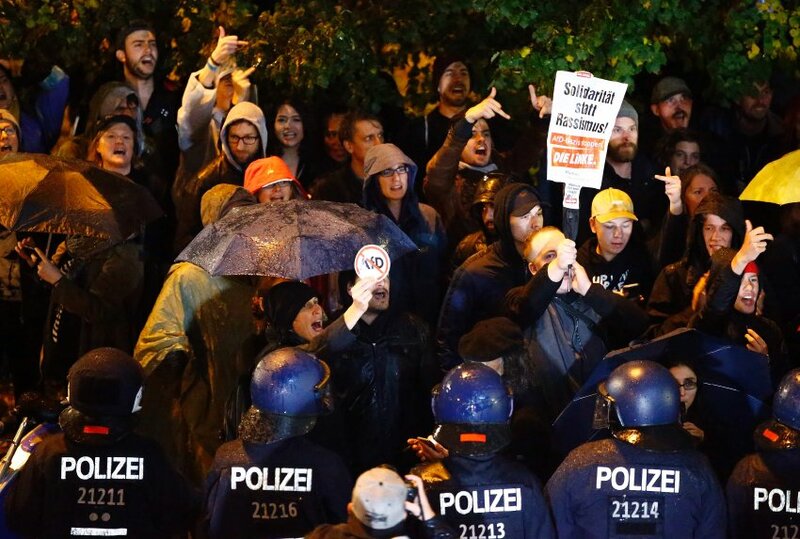 People are protesting outside of the building in which the AfD is celebrating their election results in Berlin. One of the protesters’ sign reads “Racism is No Alternative”, a word-play on the party name. When talking about the AfD, there seems to be a consensus of what led to the vote. „It was to be expected but I was still shocked when I saw the results“, explained Lisa Mai. „It is the result of two causes, fear and the feeling of being excluded, from those who don’t feel like they are profiting from current happenings, who feel overwhelmed by globalization, digitalization and migration.“ Indeed, the result for the AfD was particularly strong in the East of Germany and in structurally weak areas, where populations show little diversity. „The other parties didn't reach them.” Fritz Kerner, 27, an art student from South Germany, compared the results to other populist movements: “Gauland, Trump, Wilder, Le Pen… Pinpointing down the underlying causes is hard. I believe that this is caused by the lack of a strong left-wing in German politics. Their traditional core voters broke away and they haven’t managed to attract new voters, such as freelancers or self-employed.“ While trust in the traditional parties is going down, there is a weakening of representation of trade unions and a liberalisation of the market. The established parties were quick to emphasize that any coalition with the AfD was out of the question. Most of the press - both liberal and conservative - had been criticised by AfD as pro-refugee government-propaganda or „liars press“ and have taken a decisive stand against the party from the very beginning. Post-election talk-shows and media outlets continued to offer an exceptional position to the party: Both press and other party’s politicians tried to emphasise their distance to the AfD, with Sigmar Gabriel (the foreign minister) calling them „real Nazis“. The AfD, however, seems to rejoice this position and successfully use these comments to present themselves as being victimised by the establishment while being „the voice of the people“. Police was present to keep protesters from the building. Some of the protesters threw stones at the police. A woman at one of the protests holds up a sign with the words “Don’t repeat history”. For now, the focus should return to the new government: „I hope that the other parties will compromise and do politics instead of party politics“, says Schmidt. „They mustn’t be dragged down by the AfD. In the end, I hope that all of AfD’s talk will come to nothing: I hope they will dismantle their own arguments in parliament.“ Debate post-election had focused less on the actual government formation. As of now, the most likely government would consist of a so-called „Jamaica“ coalition, led by CDU/CSU, the pro-business liberal party (FDP) and the Green Party – a constellation that has never existed on a national level before – if the parties find some consensus. Some have suggested seeing the election as a chance. Some argue that the AfD election results show that formerly alienated social strata showed an interest in politics. Modern democracies - often leading elite discourses - could profit from this - if they try. A voter turnout of 77 percent, with many voters trying to counter the right of right-wing, is positive. It may even signal that the political apathy that had to seem to inhibit many of the public discourses is over. The best way seems to be a cautious attempt not to overreact. The AfD in Germany is still politically isolated and their role in parliament is but a minor one. However, the prospect of a united far-right effort in the European Parliament is frightening. Recent Graduate in BSc. Communication and Cultural Management with a Minor in Corporate Management & Economics at Zeppelin Universität Friedrichshafen Member of the German National Merit Foundation. "When it comes to writing, I agree with Jules Renard: Writing is a way of talking without being interrupted. GYV is a great way to publish all the little stories that would otherwise be interrupted or go unwritten."